In this continuation of the Baxter Family saga, Ashley Baxter Blake makes it her mission to reunite two people who, as children, shared a tragic moment – the loss of parents in the Oklahoma City bombing. Each year since they met, Brady Bradshaw has left a note at the memorial for Jenna Phillips, but she has never responded. It is Ashley’s hope that by bringing them together again, they may be able to help one another heal. From #1 New York Times bestselling author Karen Kingsbury comes a brand-new love story in the Baxter Family collection about two people who lost their parents in the same national tragedy—two people desperate to find each other and the connection they shared for a single day&hellip;a day that changed everything. Brady Bradshaw was a child when the Oklahoma City bombing killed his mother. Every year, Brady visits the memorial site on the anniversary to remember her. A decade ago on that day, he met Jenna Phillips, who was also a child when her parents were killed in the attack. Brady and Jenna shared a deep heart connection and a single beautiful day together at the memorial. But after that, Brady never saw Jenna again. Every year when he returns, he leaves a note for her in hopes that he might find her again. This year, Ashley Baxter Blake and her sister Kari Baxter Taylor and their families take a spring break trip that includes a visit to the site to see the memorials famous Survivor Tree. While there, Ashley spots a young man, alone and troubled. That man is Brady Bradshaw. A chance moment leads Ashley to help Brady find Jenna, the girl he cant forget. Ashleys family is skeptical, but she pushes them to support her efforts to find the girl and bring them together. But will it work? Will her husband, Landon, understand her intentions? And is a shared heartache enough reason to fall in love? Deeply emotional and beautifully romantic, To the Moon and Back is an unlikely love story about healing, redemption, hope and the belief that sometimes a new tomorrow can grow from the ashes of a shattered yesterday. Karen Kingsbury, #1 New York Times bestselling novelist, is Americas favorite inspirational storyteller, with more than twenty-five million copies of her award-winning books in print. Her last dozen titles have topped bestseller lists and many of her novels are under development as major motion pictures. Her Baxter Family books are being developed into a TV series slated to debut fall 2019. Karen is also an adjunct professor of writing at Liberty University. She and her husband, Donald, live in Tennessee near four of their adult children. a day that changed everything. Brady Bradshaw was a child when the Oklahoma City bombing killed his mother. Every year, Brady visits the memorial site on the anniversary to remember her. A decade ago on that day, he met Jenna Phillips, who was also a child when her parents were killed in the attack. Brady and Jenna shared a deep heart connection and a single beautiful day together at the memorial. But after that, Brady never saw Jenna again. Every year when he returns, he leaves a note for her in hopes that he might find her again. This year, Ashley Baxter Blake and her sister Kari Baxter Taylor and their families take a spring break trip that includes a visit to the site to see the memorials famous Survivor Tree. While there, Ashley spots a young man, alone and troubled. That man is Brady Bradshaw. A chance moment leads Ashley to help Brady find Jenna, the girl he cant forget. Ashleys family is skeptical, but she pushes them to support her efforts to find the girl and bring them together. But will it work? Will her husband, Landon, understand her intentions? And is a shared heartache enough reason to fall in love? 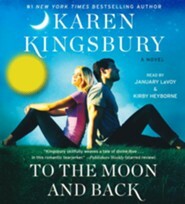 Deeply emotional and beautifully romantic, To the Moon and Back is an unlikely love story about healing, redemption, hope and the belief that sometimes a new tomorrow can grow from the ashes of a shattered yesterday. 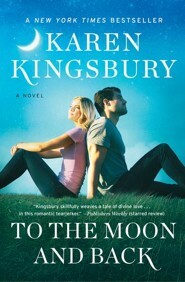 "Kingsbury skillfully weaves a tale of divine love. . .in this romantic tearjerker." "Heart tugging and emotional... will touch readers deeply." 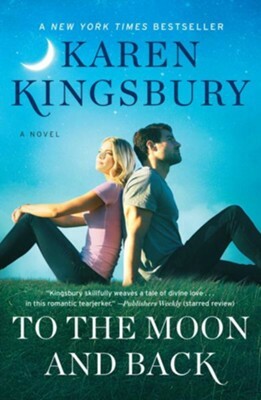 "Kingsbury writes with seemingly effortless poetic elegance, capturing the tender, intimate moments of daily family life as well as heart-wrenching flashbacks to fatal tragedy. A moving story of survival, of faith, and of beauty from the ashes." I'm the author/artist and I want to review To the Moon and Back, The Baxter Family Series.